Just because many of the listeners on D-COT overlook it, doesn’t mean there isn’t still magic behind the music with the former show at the ABC Sound Studio. D-COT is home to thousands of members, and of those thousands of members, 9 have added this to their favorites and 2 have added it to custom playlists. These may be unimpressive stats, but don’t write off this track just yet! On May 1, 1989, Disney’s MGM Studios (now Disney’s Hollywood Studios) theme park opened with all the fanfare Disney could muster. They captured the grand opening spectacular into a 2-hour television special, where most theme park celebrations only got 1 hour. The theme park was designed to take guests through the golden age of Hollywood and a combination of attractions that put the film-making process on display in fun and interactive ways. One key part of making any film is sound effects. Disney designed what we know today as the ABC Sound Studio for the purpose of showing guests the important role that sound effects creation plays in the film industry. Originally this location housed the Monster Sound Show starring Chevy Chase and Martin Short in a film with silly sound effects. In 1997, Disney changed it to One Saturday Morning where guests created sound effects for 101 Dalmatians: The Series. That lasted for a little over two years when it was replaced with Sounds Dangerous starring Drew Carey, which is what we are listening to on this D-COT track. This show closed in May 2012, making it the longest-lasting show in this location to date. After Sounds Dangerous closed, the ABC Sound Studio has been used for multiple short-run shows like sneak peaks for upcoming films and various Star Wars related showcases. This track was added to D-COT on April 26, 2011 and has been played over 3,900 times. Again, this may be an unimpressive statistic, but what is impressive is the track itself. Only 24 members have rated this track so far, but they haven’t given it an average rating of 4.3/5 for no reason. Many of us D-COT members love the jukebox as we can listen and have our minds create the mental picture of being on location based on our fond memories of actually being there. The best part about this track is that, while we cannot actually see anything, the vast majority of Sounds Dangerous was only heard! 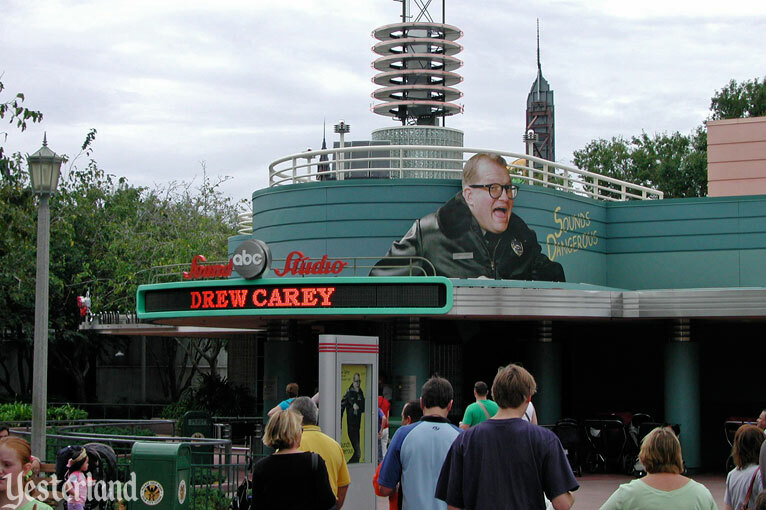 The attraction followed Drew Carey as a bumbling undercover detective with camera and microphone in a “TV pilot episode”. The audience used ear phones to get a precise sense of the sounds while a large screen showed the visual from Drew’s camera…which shorts out seconds into the show. For almost the entirety of the show, the audience is just hearing what is going on and is forced to imagine the visual based solely on the sound effects. That is precisely what D-COT listeners do with every track we play! It’s a great way to exercise your imagination and get a feel for what film, and perhaps life, would be like without sound. Awesome article and great background into the music! Thanks! Agreed — you’re gonna make me give this a listen! Great article! I remember creating sound effects for 101 Dalmatians! I loved the Soundsations show and listen to it all the time on the Jukebox. Like you said, a perfect track because it was only sounds! I remember all of the sound shows that you mention… and those were the good ole days of MGM Studios!!! I really loved all of the film, and movie, and sound shows that they had way back then in the park.